Aspen played a role as an early successional species after fire in boreal forests, cold-temperate forests, and in the aspen parklands of northwestern Minnesota. In the parklands it can be maintained as a permanent dominant species in the vegetation by frequent fire, occurring with patches of prairie and shrubland. In boreal forests aspen occurs along with jack pine after crown fires on well drained rocky soils on the Canadian Shield, in the early successional stages of red and white pine forests, and most importantly, it plays an important role in the fire dependent boreal mixed-wood forests in the northern Great Lakes. Mixed wood forests of quaking aspen, paper birch, balsam and white or black spruce that regenerate to mixtures of birch and aspen after fire and later succeed to mixed composition and finally to spruce and fir. Spring fires tended to favor aspen while midsummer and fall fires favored paper birch. 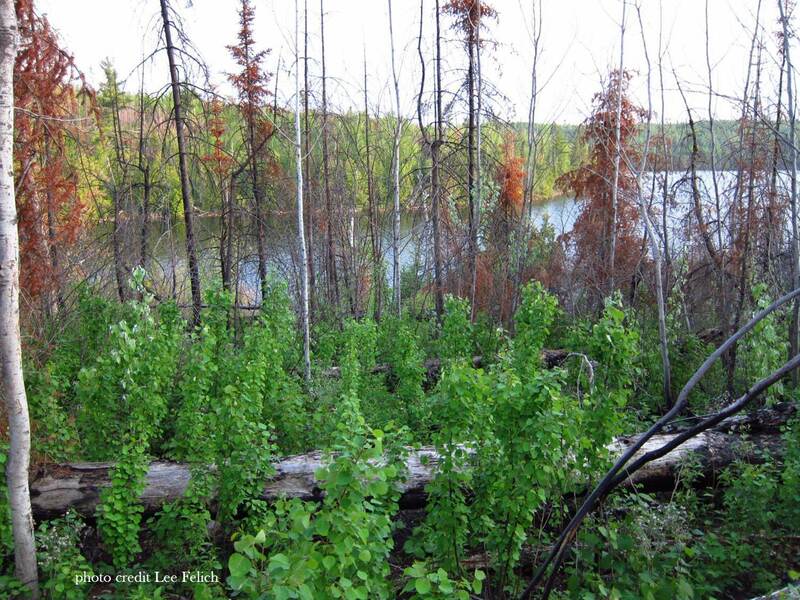 Groves of aspen are common on sandy outwash plains that historically had frequent fires and either jack pine, pin oak and bur oak, or prairie edges throughout the Lake States. In northern hardwood-hemlock forests, aspen with paper birch occurs as the early successional stage after windfall-fire combinations. These stands were rare on the pre-European settlement landscape, because stand levelling disturbances were rare. However, the cutover that occurred during settlement was often followed by slash fires, mimicking the windfall-fire combination, but over a large proportion of the landscape, creating the vast acreages of second growth aspen that today is maintained (with varying degrees of success) by clearcut logging. Many of these second-growth aspen stands are succeeding to maple, red oak or spruce and fir, depending on the local climate.